11 December, 2018 (Toronto, ON) – Chart topping alt-rockers Mother Mother are ending the year on a high note with their hit single, “Get Up” claiming the #1 spot at Canadian Alternative Radio this week. The song has been rocking the charts ever since its debut when it impressively took the title of #1 most added song at Canada Alternative Rock radio that week. The single is off the band’s latest album, Dance and Cry released via Universal Music Canada, the country’s leading music company in November. Music fans can listen to the album HERE and watch the video directed by Connor McGuire and shot in Vancouver HERE. In addition to having the #1 spot at Canadian Alternative Radio, the band has added new show dates to their North American tour due to overwhelming demand in cities including Los Angeles, Victoria and Toronto. The Vancouver-based group announced the Dance and Cry tour in November and it kicks off on January 12 in Phoenix, AZ with extensive stops throughout Canada and the United States. 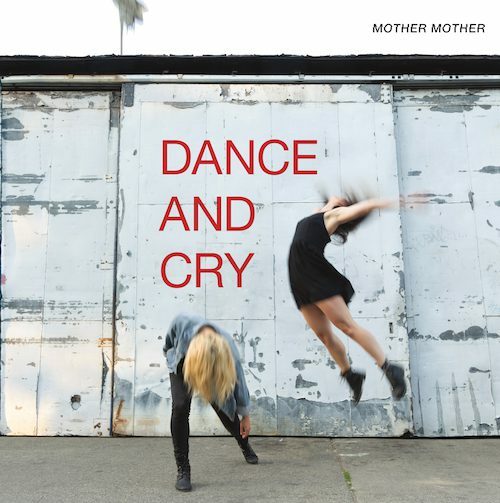 It’s been a milestone year for Mother Mother who in the past twelve months have released their seventh full length album, Dance and Cry, to rave reviews from both critics and fans alike. This summer the band wrapped up a successful tour in celebration of their iconic album O My Heart’s tenth anniversary. Mother Mother is currently in rehearsals for their tour and are eager to hit the road and perform the new tracks to live audiences’ across North America. Tickets for the Dance and Cry tour are on-sale now, full details below with new shows bolded. The Juno and MMVA nominated Vancouver-based band, comprised of Ryan Guldemond, Molly Guldemond, Jasmin Parkin, Ali Siadat and Mike Young, has had a whirlwind decade; garnering six top 10 singles on the alt rock Canadian charts and 41 million streams and counting on digital platforms. Their latest album, 2017’s No Culture, produced “The Drugs” a #1 single on the Alt Rock charts in Canada for three consecutive weeks. The alt-rockers first earned critical acclaim with their debut albums Touch Up (2007) and O My Heart (2008). The releases that followed, Eureka (2011) and The Sticks (2012) delivered the top 5 radio hits “The Stand”, “Bit By Bit” and “Let’s Fall In Love”, making the band the second most aired alternative act in Canada in 2012 and 2013. In 2014 they racked up more hits with “Get Out The Way”, “Monkey Tree” and “Modern Love” from their much-lauded record Very Good Bad Thing. The band has also found success on the road, most recent tours include sold-out headline dates across North America, selling out the historic Massey Hall, and a record-breaking five consecutive sold-out shows at the Commodore Ballroom in Vancouver.